Groups: A Counseling Specialty is a comprehensive look at groups, covering the history of group work, the dynamics of groups, leadership in groups, ethical issues in groups, multicultural aspects of groups, stages of group development, groups across the life span, and the theoretical basis for working with groups. The coverage is current, the style is clear and interesting, and the book challenges students to reflect on what they have learned, as well as on their own experiences in groups. 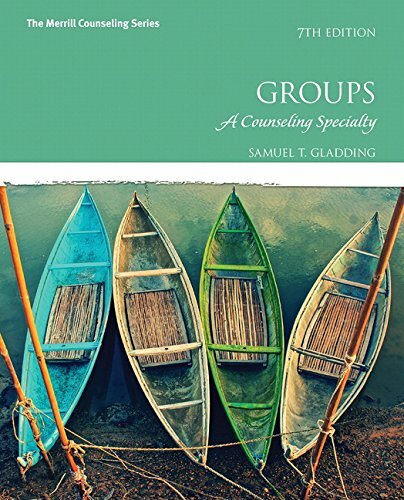 The new edition of Gladding’s Groups includes over 120 new references; chapter overviews; brief introductory stories; a new appendix on self-help group organizations; and new material and updates throughout, including additions that focus on social justice, creativity (particularly the work of Keith Sawyer), different specialty groups throughout the lifespan, technology and group work, brief groups, and groups for older adults.